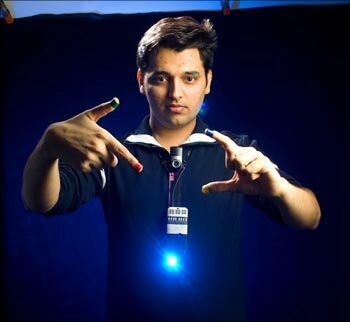 If Pranav Mistry has his way, people around the world can build their own wearable ‘SixthSense’ — which uses a camera that understands human gestures — at a cost of less than Rs 15,000 ($300) by obtaining the software he developed for free in the next few months. Mistry, a PhD student in Pattie Maes’ Fluid Interfaces Group at MIT’s Media Lab, is the genius behind SixthSense, a wearable device that enables new interactions between the real world and the world of data. “People will be able to make their own hardware. I will give them instructions how to make it. And also provide them key software…give them basic key software layers. . . they will be able to build their own applications. They will be able to modify base level and do anything”. SixthSense, which redefines how we uses objects and gestures to interact with the digital world, was cobbled together with components that are off-the-shelf. SixthSense was voted the Invention of the Year by Popular Science magazine in the United States, and Mistry won one of Technology Review’s TR35 Young Inventor Awards in August this year. Mistry developed the SixthSense device to satisfy his impulse to paint the physical world with digital information. 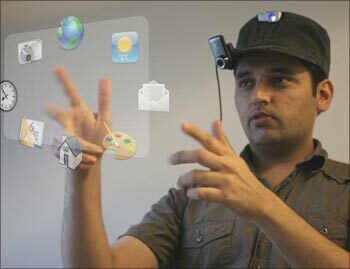 Using a camera that understands human gestures, the SixthSense has extraordinary capabilities, Mistry said. The technology is integrating the digital and physical worlds, rather than forcing one to switch back and forth between the two. SixthSense comprises a pocket projector, a mirror and a camera. The hardware components are coupled in a pendant like mobile wearable device. Both the projector and the camera are connected to the mobile computing device in the users pocket. Giving examples about its use, he said SixthSense lets the user draw icons or symbols in the air using the movement of the index finger and recognises those symbols as interaction instructions. Likewise drawing an @ symbol lets the user check his mail. “The digital world has power because it has dynamic information, but it’s important that we stay human, instead of being another machine sitting in front of a machine,” said Mistry who, before his studies at MIT, worked with Microsoft as a UX researcher. Some previous projects from Mistry’s work at MIT include intelligent sticky notes, Quickies, that can be searched and can send reminders; a pen that draws in 3D; andTaPuMa, a tangible public map that can act as Google of physical world. His research interests also include Gestural and Tangible Interaction, Ubiquitous Computing, AI, Machine Vision, Collective Intelligence and Robotics. when will these softwares will be available on net………..and when will be the instructions to make this hardware will be available on net….. I am really impressed about what you made. The excellent thing is that you made an relation between real and digital world thats great. carry on.